"Hi, it´s ANDY - Your new single is GREAT. Checkout STRASSE in the next Interview." 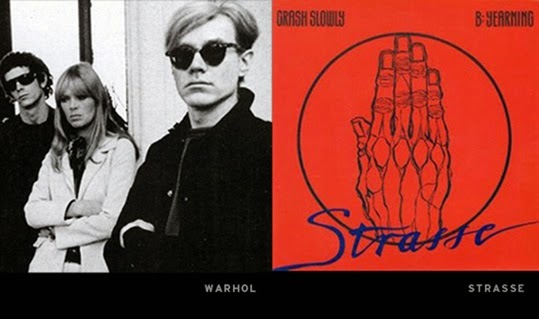 "Mindblowing at the time", says STRASSE on having ANDY WARHOL as a mentor. "Even today it´s hard to believe it really happened. We first met at party in the early 80s. We talked about music, art and stuff. Andy had not heard of STRASSE but was very keen to listen. We were stunned. This was the man behind The Velvet Undergrounds debut album! "Why don´t you come to my place (The Factory) next week?". He was always very kind, generous and took time to help us out whenever he could. - Of course we wanted Andy to make a music video, but we could never come up with the right song. When we finally did the world was hit by bad news. Andy Warhol passed away in February 1987. STRASSE single: Crash Slowly.